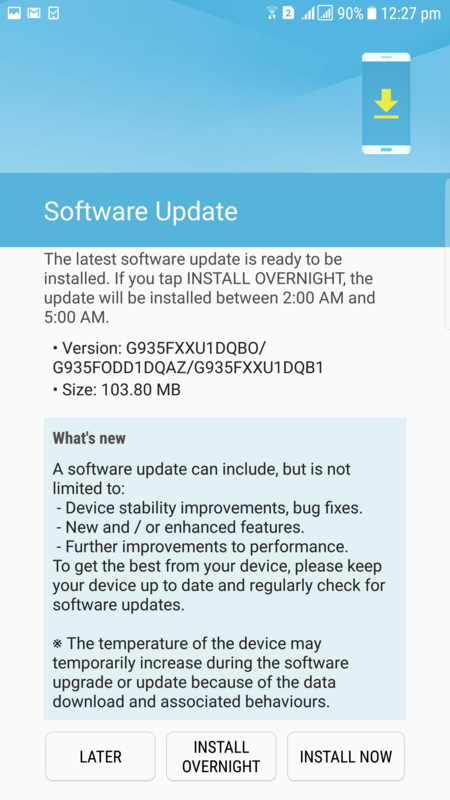 After a long wait, Samsung has pushed the February security patch to the flagship Galaxy S7 Edge device in India, the company has already rolled out the update to the Galaxy S7 units in the country a week back. The new update weights 104 MB in size and comes with the February security patch and bumps the security patch to February 1 from January 1. The new update also comes with some bug fixes, stability improvements, performance improvements and other enhancements as well. 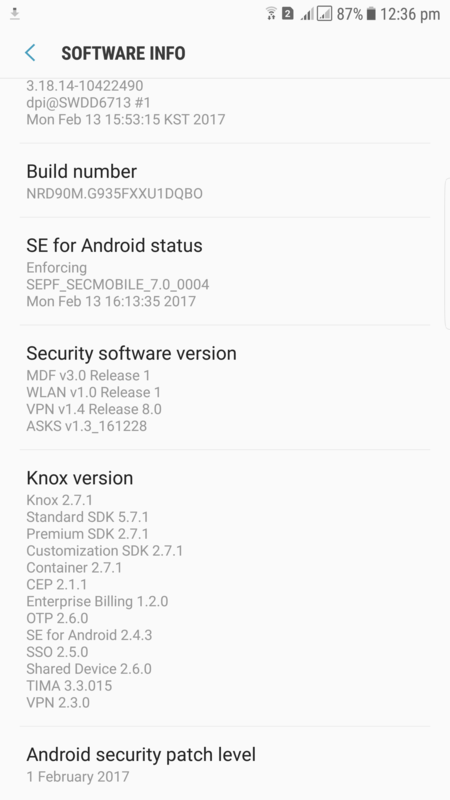 The build number of the device is now bumped to XXU1DQBO and there are no other changes we noticed after the update. The company started rolling the Android Nougat update to the flagship Galaxy S7 and S7 Edge devices in January this year in number of regions after beta testing the software for a month. The new update brought new UX design, multi window feature, improved settings menu and AOD feature, addition of Samsung Pass feature, efficient space for installation of the downloaded apps, improved speed of system upgrade and app installation and other performance modes also. The Korean manufacturer also provided the Samsung Pay app for the Indian users in the Nougat update bundle which is still left to launch in India while some countries have already got it launched. To recall, the Galaxy S7 Edge was launched with a 5.5-inch QHD Super AMOLED display and is powered by Samsung’s octa-core Exynos 8890 SoC. It has 4GB of RAM and 32GB inbuilt storage capacity with up to 256GB expandable MicroSD card storage with the help of Hybrid Dual SIM. It features a 12-megapixel Dual Pixel rear camera with f/1.7 aperture, smart OIS and a 5-megapixel front camera with f/1.7 aperture. It runs Android 6.0 Marshmallow OS and comes with IP68 rating for dust and water resistance. It is backed up by a 3600mAh battery. The company has recently announced its March 29th event in New York where we may see the launch of the new Galaxy flagship devices Galaxy S8 and Galaxy S8 Plus that will have a new design with no front home button. The company is rumored to provide the fingerprint scanner on the rear side of the device near the rear camera. According to the rumors, the Galaxy S8 is expected to launch with a 5.8-inch Quad HD+ curved Super AMOLED display and is expected to be powered by the Qualcomm Snapdragon 835 or an octa-core Samsung Exynos 9 Series 8895 processor. Other specs includes 4GB of RAM, 64GB internal storage, MicroSD card expandable storage, Android 7.0 (Nougat) OS, Dual-SIM, a 12-megapixel Dual Pixel rear camera, an 8-megapixel front-facing camera, a 3000mAh battery with fast Charging, 4G VoLTE connectivity and fingerprint sensor, Iris scanner and Barometer and IP68 ratings. The larger variant Galaxy S8 Plus is expected to comes with 6.2-inch Quad HD+ curved Super AMOLED display, a Qualcomm Snapdragon 835 or Octa-Core Samsung Exynos 9 Series 8895 processor, 4GB of RAM, 64GB internal storage, MicroSD expandable storage, Android 7.0 (Nougat) OS, Dual-SIM, a 12-megapixel Dual Pixel rear camera, an 8-megapixel front-facing camera, a 3500mAh battery with fast Charging, 4G VoLTE connectivity and heart rate sensor, fingerprint sensor, Iris scanner and Barometer and IP68 ratings. Next articleOppo’s 5X optical zoom technology spotted on a mystery Oppo device with dual rear camera, is it the Find 9?